The age at which a child should start playing sports is not set in stone. That being said, according to KidsHealth, a child is emotionally and physically ready for organized team play by the age of 6 or 7. Before that time, your tot's attention span and coordination may not match up well with the skills needed for sports. 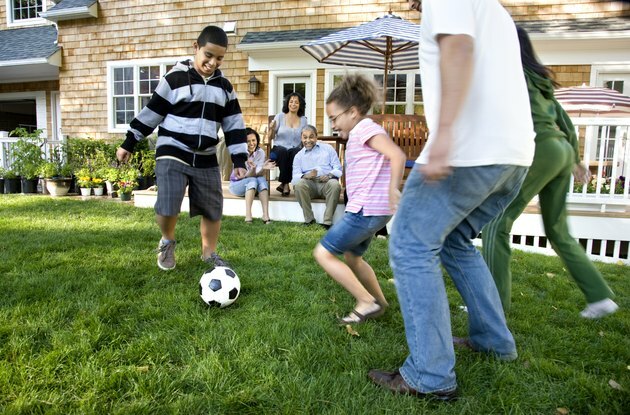 Your kiddo may love kicking a ball around the yard and riding bikes in the driveway, but that doesn't mean he is ready for sports. As KidsHealth points out, although organized sports for kids as young as preschool age are available, a first grader is much more primed to play well with others. Indeed, by the age of 6 or 7, a child grasps concepts like passing the ball to a teammate, listening to the coach, and paying closer attention to the game than to waving to mom and dad. Kids develop differently, so perhaps your kindergarten-age child is ready for recreational sports. Just be sure that your sweetie has the physical, mental and social skills needed to play, because, as HealthyChildren.org notes, he will be more likely to succeed when he is ready. Ask yourself if your angel has the attention span for an entire game of, say, soccer or basketball. Does he share with others? Is he physically coordinated? If the answer to these questions is "yes," then fire up your video camera and get ready to watch your wee one tear up the field or court. Most preschoolers have not yet mastered skills like throwing, catching or taking turns, reports KidsHealth. So, signing your 4-year-old up for T-ball may simply serve to frustrate him if he has difficulty understanding the rules of the game or lacks skills needed to play. You wouldn't want to to turn your tyke off to sports all together with a bad introduction. This is why holding off on sports until the appropriate age has its benefits. Just because your little one is not quite ready for competitive team play, it doesn't mean he can't enjoy sports. HealthyChildren.org notes that 2- to 5-year-olds can benefit from activities that emphasize fun, cooperation and basic skills. Look for a program that is more about enjoyment than winning. At this stage, you want to focus on exposing your pewee player to a sport, not pressuring him to be a superstar. HealthyChildren.org: Is Your Child Ready for Sports? KidsHealth: Should Your Preschooler Play Sports? How Can a 13-Year-Old Girl Lose Stomach Fat?